Okay, so maybe Kris was just a backwoods hick who had gotten used to running around the woods in hunting leathers and boots that had been broken in for a year, but he did not see how anybody managed all of this crap, and anyway he thought that he could've at least started a little slower. There had been a couple of other men in the great hall who weren't wearing the ruff collars, and barely anyone was wearing the freaking jeweled hand netting, so this was seriously not his fault. "Hold still," Lord Cowell's valet Miles said tensely, working; he was trying to get the netting loose from Kris's brand-new doublet without tearing the velvet. He'd hauled Kris out to the cloister outside to get a little bit more light from the torches in the garden. The hard driving beat of the music was thumping through the flagstones. "The king really wants everyone dressed like this?" Kris said, staring up at the ceiling, feeling half-strangled. "I don't—" He coughed, choked, as Miles grabbed the corset laces and pulled tight, squashing the air out of Kris's chest. "Ow," he wheezed. "Fashion follows the king," Miles said. "The king really wants to be dressed like this?" Kris said. "What is even up with—please tell me you're done?" "Yes," Miles said, straightening up. Kris yanked the collar off and breathed out hard against the corset laces. "Just—the collar? And corsets? Come on, this would make anyone look stupid. Uh, not to criticize," he added, because Miles was looking horrified. "Well, that's good," someone else said, behind him, and Kris turned around and stared at the king, who was leaning against one of the columns, his arms folded and smiling a little, his eyes glinting. He straightened up and came over, prowling almost—Kris had seen him a little earlier, coming into the hall, but only at a distance. He seemed bigger up close—tall, and his hair swept up, and on him the ruff didn't look stupid after all. Kris belatedly realized he was supposed to be bowing—or, hell, was he supposed to be going down on one knee? he hadn't been presented formally—"Breathe," the king said, catching him under the chin, and drawing him back up. His eyes were lined heavily in kohl, smudged and smoky, a sharp intense blue. "I—uh," Kris said, brilliantly, and then folded his mouth shut and yelled at himself silently for being an idiot. Daniel should've come; Daniel would be saying something hilarious and funny about his outfit right now, or at least managing to get out a decent apology. "Sorry?" Kris said, "I—that wasn't—"
The king had his head tilted to one side with a fascinated expression, like Kris was—not exactly a bug, but maybe some kind of really weird animal. It didn't make it any easier to figure out what to say. "Where did Simon find you, exactly?" the king asked. "I'm Squire Allen's son, from Conway," Kris said, and because the way this was going, he wasn't going to have another chance, he added, "We've been having border trouble—Lord Cowell brought me to court so I could tell you—" Miles was on the other side of the king, frantically shaking his head no, no, no, so Kris trailed off, darting his eyes at him in confusion. "Oh, is that why Lord Cowell brought you," the king said. So, when you say teaser, what you really mean is I WILL DEFINITELY FINISH THIS AND NOT LEAVE MY READERS ETERNALLY GASPING FOR MORE. Seriously. Whoever came up with the phrase "always leave them wanting more" was insane. And mentally deficient. And... other unflattering things. *COUGH* MAYBE I DON'T KNOW! POSSIBLY I NEED MORE INSPIRATION FROM OTHER PEOPLE MAKING STEAMPUNKY THINGS! I SINCERELY HOPE YOU MEAN TO CONTINUE THAT STORY. *BOUNCES LIKE A CRAZY BOUNCING PERSON* EEEEEEEEE! If i wasn't falling sick and back to school today I'd be looking for people in ruff collars to manip for this! I can not wait to read the rest of it!!!!! JSYK, every time Lord Cowell appears in one of your stories, I shriek in an undignified manner and wriggle in my chair. I freaking love your AUs. Come on now you have me "STARVING FOR MORE"!!!! PLEASE!!!! omg, i have to tell you your steampunk manips are amazing! i just got into steampunk and riverbella directed me. *drool* i don't watch idol so i'm kind of clueless though. is there any way i might get you to kindly do a steampunk manip for spencer reid from criminal minds? i can paypal you some $. or make a donation to your fav charity. or adam lambert's! Maybe I’m a little thick but… I just read KrisAllenPornStar and wanted to review and following the link got here. 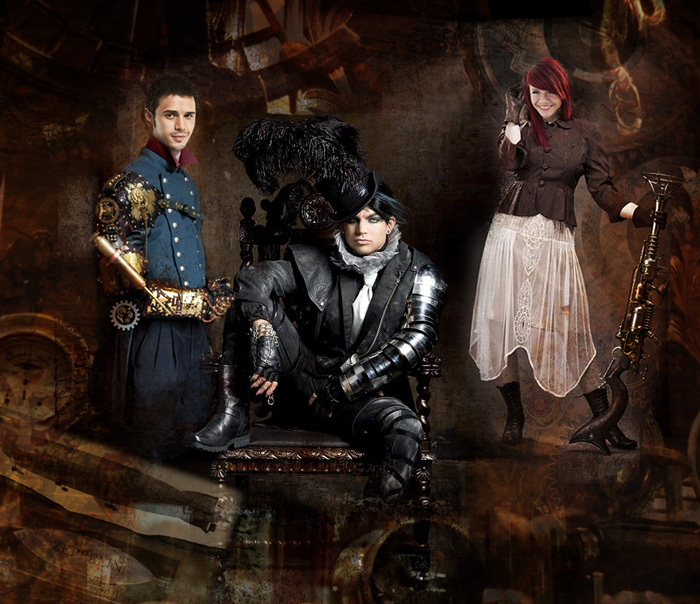 Not that I mind, I love your Steampunk universe, but how do I feedback the real thing? I lost count of how many times I reread this... love it so much! Thank you!